We had run into Anna again and she can only walk about 9 miles a day so she wanted to share a taxi with us. But she was in the albergue and we were in the hostal. She had to be out by 8 and since it was so uncertain whether we’d get a taxi she started out walking. We did our usual more relaxed get-up-and-get-ready so didn’t get to the bar until 9:00. Luckily we did get a taxi. 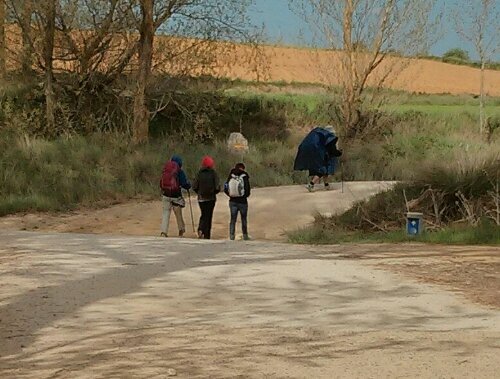 At that point the Camino runs parallel to the quiet road we were on so after a few minutes I asked the driver if, should we see a certain peregrino, could we stop and pick her up. He said yes and we started watching for Anna. 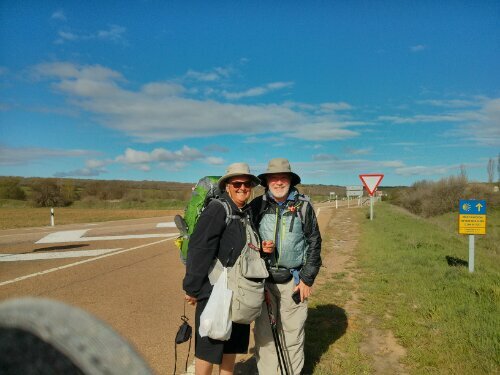 We got about 3.5 miles along, just before the road leaves the Camino, and at that point figured we’d not find her, but then we saw her. The driver pulled over, we opened the window and called to her “would you like a ride to Caldadilla?” Her face lit up and she happily climbed in. She said she had been worrying the whole way what to do. Here she is with Charlie at the point the taxi let us off. We took off walking and Charlie and I soon pulled ahead of her. We told her not to fly away in it. (She looked like she was about to take off.) Charlie was then inspired with a brilliant idea for a new TV series: The Flying Pilgrim.